Edith Delaney danced for the boys overseas. She was a tap dancer who performed with a three-member troupe that included actress/singer Ella Logan and accordionist Jerry Skelton. Delaney drew cheers and applause from the troops “when she finished her act by tossing out the red poppies she always [wore] in her hair,” according to this Wesleyan University honors thesis. She was also a war widow — possibly among the first American war widows to visit her husband’s overseas grave. I wondered what he meant by that — “you will have read all about it” — but I went on, just planning to add links to the Wikipedia entry for each of them. As it turns out, only Ella Logan has one. And Ella Logan was a bit of a big deal in her day, a Scottish songstress, a lovely girl with a few Broadway shows and a performance with Frank Sinatra on her credits. She and Edith Delaney were good friends. There were only two other person’s in Ella’s company: an accompanist and a dancer named Edith Delaney. Ella and Edie are old friends, and behind Edie’s visit to the battle area lies a story of great love. Ella passed up a number of trips overseas with important stars. Trips that would have brought her twice as much publicity. But she wanted to take Edie with her. For Edie’s husband, a lad name Jack Feinstein, had been killed in action somewhere in North Africa. “Edie said she wouldn’t believe it until she saw his grave,” Ella relates in her small, soft voice. Together the girls searched the battle cemeteries for the star of David that would be Jack’s. They found it on Hill 602, the bloodsoaked hill on the way to Bizerte. Hand in hand, Ella and Edie stood beside the grave while an army chaplain read the prayer for the dead. Then they went on to another base, put on another show for the boys. A clip from “The Billboard” entertainment magazine noting the death of Edith Delaney’s husband. American troops near the front wildly applauded two actresses — one of them a war widow — Wednesday as the first American USO theatrical group arrived in Italy for a series of field performances. The women were Ella Logan, singer and wife of Fred Finklehoffe, author of “Brother Rat,” and Edith Delaney, dancer, who made the overseas trip to fulfill the wish of her husband, Sgt. 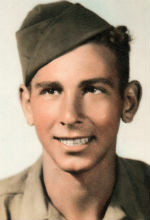 Jack Firestein, Baltimore, Md., who was killed in the North African fighting. We had a stage show a day or two ago, with personal appearances of Ella Logan, Edith Delaney and Jerry Skelton, plus our own swing band…. Edith’s husband was killed on Hill 609 in Tunisia. She is a dancer; Ella sings and Jerry plays the accordion. They take plenty of risks coming to give these shows into zones of combat. Every so often a machine gun would rattle off a few rounds and Ella would bow and say, ‘Thanks, boys’ — for the applause. We shivered in our winters and Edith wore the light dancing costume — the show must go on — and it’s no wonder that many of them catch colds and all on these tours. A close family friend directed me to your site as I am Edith Delaney’s daughter. i sat here reading your articles and letters and found myself being flooded with memories of my mother’s own retelling of these same events. I do actually have the newspaper of the Stars and Stripes with the story of her visiting her first husband Jack’s grave. My mom also saw a clip of herself dancing at a USO Camp show while watching a PBS show not too long before she passed away and we tried to find it to no avail. I would love to see it too. Hearing your father’s letter was indeed heartwarming for me. My mother was a terrific tap dancer and Ella Logan was her dear friend. I know the shows they performed with the USO meant a great deal to my mother and she had wonderful memories that she shared with us as we grew up. Thank you for recognizing my mother in your posting. Jane, I recall getting this comment from you and I’m fairly sure I responded to you by email, but I was remiss in not posting a reply comment here. I’m so grateful that you took the time to post a remark here.